Gathering to celebrate the ground breaking of the Lenfest Center at the ChesLin Preserve, local elected officials, members of the National Land trust staff and benefactors gathered, Wednesday. 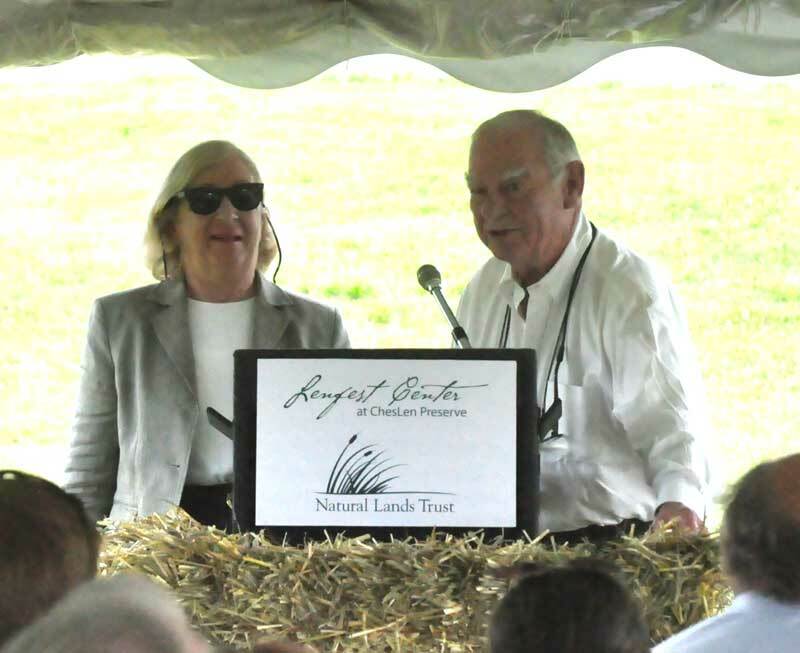 From left, back row, Molly Morrison, president of Natural Lands Trust, Gerry Lenfest and Margurite Lenfest, benefactors for both the preserve and new facility. Front row, from left: Newlin Township Supervisor Bill Kelsall, Chester County Commissioners Ryan Costello, Kathi Cozzone, Terence Farrell and Peter Hausmann, chairman of Natural Lands Trust’s Board of Trustees. NEWLIN — For a place the neighbors used to call “the junkyard,” the already strikingly beautiful ChesLen Preserve is about to get even nicer — and better for local residents, more user-friendly. 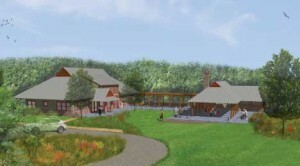 With Wednesday’s ground-breaking ceremony for the Lenfest Center at the ChesLen Preserve, construction work will begin in earnest on the 9,300-square foot building expected to be complete in early 2013. The building, designed by Archer and Buchanan Architecture, will be used for gathering space for on-site volunteers, as well as visitors and local organizations. It will also provide office space and storage for maintenance equipment for the Natural Lands Trust, which oversees the 1,263-acre preserve — one of 12 it manages in Chester County. 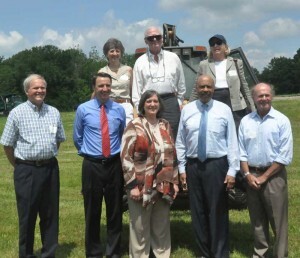 Representatives from the Natural Land Trust, local elected officials and the benefactors for whom the building is named — and the donors of the initial 563-acre tract that makes up nearly half of the current ChesLen Preserve — Gerry and Marguerite Lenfest, gathered to celebrate the start of construction with a formal program on the 20-acre site where the building will be built. An artist's rendering of the new Lenfest Center at the ChesLin Preserve. The 9,300-square-foot facility will offer space to help manage the preserve as well as public spaces, including a meeting room. Image courtesy Archer and Buchanan Architecture. Bill Kelsall, representing his colleagues on the township’s Board of Supervisors, said he marveled at the changes wrought since the property — former home of a mushroom cannery (and why Cannery Road is so named) — since it became the first piece of the preserve. Marguerite and Gerry Lenfest talk Wednesday about the process that led to the creation of the ChesLin Preserve and the new Lenfest Center. And Kelsall noted that the changes to the property haven’t just had an impact on the property formally preserved. “We had a subdivsion that was supposed to go in just down the road,” he said. “That would have been 12 units (houses) — but now, it’s not going to be sold as one parcel, it’s going to stay as a farm.” He said that the impact of the ChesLen Preserve had changed thinking and specifically in this case, slowed or prevented development. Plus, he noted, the new Lenfest Center will enhance an experience already enjoyed by many in the township and surrounding towns. “I walk on this property, every day,” he said. “I really enjoy it.” He added that since NLT took over the property, various species of wildlife, blue birds and bald eagles, among others, not seen in generation have returned to the area. All three Chester County Commissioners, Terence Ferrell, Kathi Cozzone and Ryan Costello were in attendance — appropriate, as the county donated a second 500-acre tract that made up the original preserve. A later purchase added 195 acres. But it all started with the Lenfests. And Gerry Lenfest made it clear, in his mind, the real genesis came from a letter sent to him. After acquiring the 563-acre parcel, Lenfest originally intended to cluster housing units and preserve the rest as open space — something that would generally be seen as good thing, from someone buying a large tract of developable property. Now that dream is being realized in the building of the Lenfest Center. While the Lenfests have been involved in many other charitable ventures around southeast Pennsylvania, including support for the Barnes Foundation art collection, some would argue that ChesLin represents the apogee in giving back to the community. Hausmann said he would argue the work being done in the middle of a Chester County pasture is more important than those many other projects and will have a longer impact. “This will be the most permanent and the most giving,” he said. The Lenfest Center will offer storage and maintenance areas for management of the preserve, two offices for staff, a meeting room for groups of up to 35, an open-air pavilion, lockers and a small kitchen for use by volunteers assisting with management and public restrooms. It is expected to be completed in early 2013.